For a good mid-priced reflecting telescope it is hard to beat the current offering of Orion. In particular this model is an astrophotography blitz that really can get you some of the best color rich pictures in the galaxy. It has a large 8 inch aperture and quick f/3.9 focal ratio. The performance is top notch and will impress anyone that has never used a reflector telescope before. Contrast is enhanced with the nine internal baffle rings and long tube length. Orion went out of their way to include image enhancing techniques on the internals, which is why the pictures come out crisp no matter where you end up pointing it. Professionalism is key with this product, and besides the usual black finish they stayed away from making it glossy. This means it looks like an actual telescope and not a kid’s toy. The only available styling is reflector, which explains why the images and colors are so top notch. Layout of the product is perfect, and it is easy to find all settings without getting lost, even if you don’t use the manual. And there are a lot more features to use with this model than others, so that’s a big compliment. Besides making it user friendly they made the packaging stress free so that you have a good idea what every piece and its role is. Intermediate to experts. Since beginners don’t usually jump headfirst into astrophotography, it is safe to assume that there are a lot of features on here that would make a beginner dizzy. These are all optional to use, but they greatly improve the effectiveness of the image. This includes adjusting the mirror when necessary and taking advantage of the light gathering. With some of the more advanced accessories included with the package, it screams mid-high level usage. Beginners can use it, but only if they have a general idea of how to use a scope. Since this is a reflector telescope, lack of maintenance will kill its usefulness over the years. Most people know the story with reflector telescopes, so it is no surprise that this is of average durability. It won’t break easily, but it also can’t take extra impact like fellow refractor telescopes. And with the built in mirror being the prime useful setting of this scope, that getting out of alignment or rattled can lead to some frustrating stargazing. These type of scopes are all about finding that sweet spot and keeping it there. So buyers that plan on doing a lot of roughhousing with this scope will find it a bit of a bittersweet experience. It’s a bit less than the scopes with similar power ratings and apertures. Image optimization is the real deal with this scope, and it can handle a wide array of tasks thrown its way. Whether near or far, it will always get a good image if setup correctly. An extended tube length and the multiple internal baffle rings gives you the best image contrast ever without distortion. You’ll enjoy high quality primary and secondary mirrors that are built on providing you with up to 94% reflectivity, one of the highest in the industry. This is about as close to a 1:1 ratio as you are going to get with picture quality from outer space. The price is pretty good, but it doesn’t come with a mount or tripod. This is just for the price of entry, in that you get a superior scope that is one of the best on the market. This means you have to go out and make an extra purchase if you don’t already have a compatible mount and tripod to place it on. It also weighs a little more than scopes of the same type, but not by much. It’s still enough to make it stand out, so if you planned on carrying this in a suitcase for long periods of time, be prepared. With the mount not being included, the company had to do a little digging to find the perfect companion pieces for this model. But the only thing they got was your standard finder. There is no mount, tripod, eyepiece, software, DVD, or even collimator included with the package. It is bare bones and comes as it is with no special accessories to speak of. If you don’t already have any of the pieces in your home, then by the time you finish buying them you’d have paid for another one of these telescopes. It should be pointed out that although these are great accessories to have, they are all optional. This is a tough since the only thing to really go buy is the scope itself. Is the scope by itself worth the price tag of entire sets? The answer is yes, if it’s this telescope. Images this clear don’t often come on scopes unless they are in the high priced range. Having a mid-priced telescope with high priced features is a great value, and one that adds to the total value of it, even if it is just the scope itself. At this point the value of it is going to boil down to whether the user cares about buying extra stuff, or if they already have extra accessories in their possession. It’s kind of hard to argue with the lasting appeal of this scope since it is so powerful. It uses updated technology and enhanced mirrors in order to get you the best image possible. This is something that not many scopes can do this accurately, so expect this product to be around as a rival for a long time. Many newer features that were introduced in this telescope are also in scopes that were created after it. So in some ways it is an innovator of the current series for Orion. It also helps that it is a professional looking scope, so besides having the power to back it up for years it will also maintain a very good appearance. Don’t be surprised to see this in someone’s arsenal years after they have purchased it. 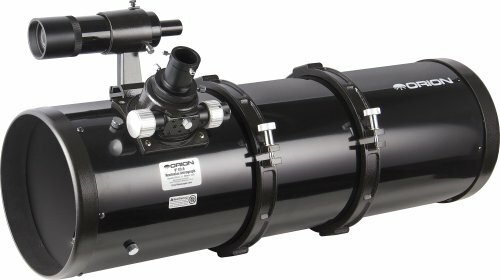 Going deep into their lineup, buyers should compare this to the Orion 8944 SkyQuest XT6 Classic Dobsonian Telescope. It is a Dobsonian type telescope on a fitted base, so out of the box it is a steal since it’s priced a little less than the 8297. But it also lacks the big power punch of the 8297, so it loses the lasting appeal and level choice. The SkyQuest XT6 is a solid overall choice, but without the same image quality and expansion choices of the Orion 8297 8-Inch f/3.9 Newtonian Astrograph Reflector Telescope. It’s hard to justify paying this much for just a scope, but in the case of the Orion 8297 it is a no brainer of a deal. This telescope is just too powerful to pass up, even if you don’t have compatible accessories. You will end up spending a little extra money trying to complete the set, but at the very least by doing this you can build it the way that you want. Easily one of the better deals on the market, users should consider this a serious buy. How to Make a Telescope?